After 35 votes, you all had yourselves in a near deadlock for first place. Sure, higher time-sinks fell behind by a few percentage points, but it’s important to note that, with just one more vote, it would have probably won, or at very least tied the others. This poll came so close that if you look at it directly from twitter, it says that shorter time-sinks won! What does this tell us though? Well, for starters, we know that this reflects the discussions we’re having internally. That’s pretty interesting. It’s also clear that we can’t just go flush across the board with this one, not if we want to make the most compelling gameplay experience that we can. 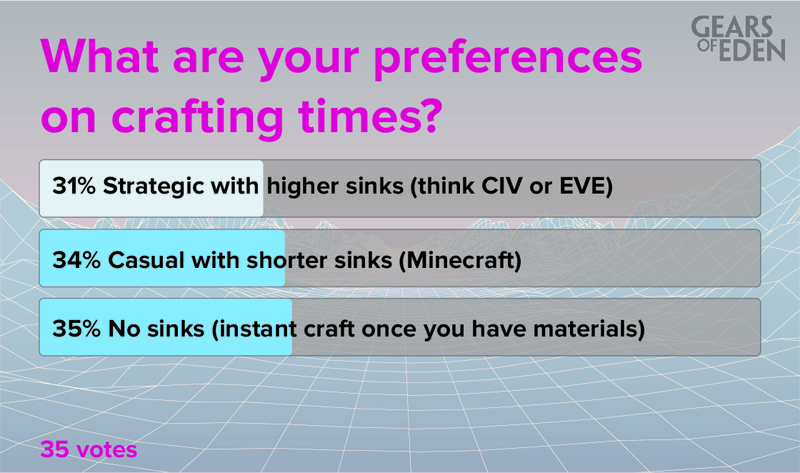 A possible idea that this poll offers is that maybe we could stagger the crafting times. Speaking in terms of Minecraft (simply because of its ubiquity), crafting wooden planks is as instant as pressing a button, while smelting a bar of gold or brewing a potion takes some time. Perhaps we could stagger the crafting times based on complexity of process or importance? Let us know your thoughts in the comments below. We have a team full of wonderfully creative people, and I’m certain that together, and with your feedback, we’ll come to an agreement that works for all of us! This week, we take another broader view in our poll, and ask how much time you spend gaming each week. This information ties into mechanics like crafting times, as it gives us a rough idea of how much time our audience enjoys spending in game (and what percentage of that time that time they might want to spend on crafting). That’s it for this week! If you haven’t done so, please sign up for our newsletter to be eligible for free alpha testing and weekly updates! We’re trying to do space exploration right in Gears of Eden, and we could certainly use your help. Follow us on Twitter, Facebook and Instagram to keep up with the latest (and give us some likes and shares). Lastly, you can help Gears happen more quickly by becoming an official backer. Check out our rewards page for more information! Thanks for your time, and check back on Wednesday for our latest Development Update!